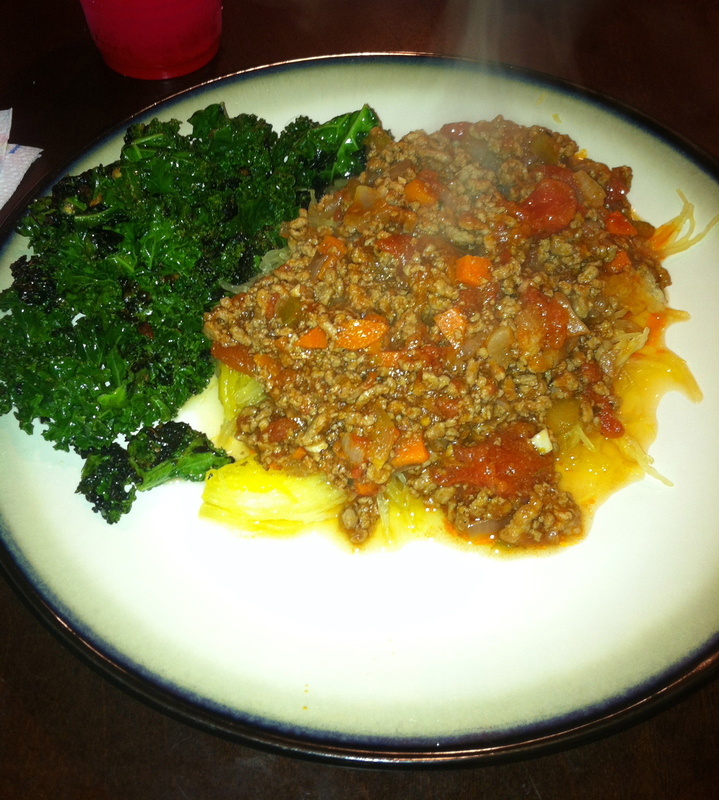 Recipe: “Spaghetti” with sautéed Kale. This recipe was actually a little frightening to me. 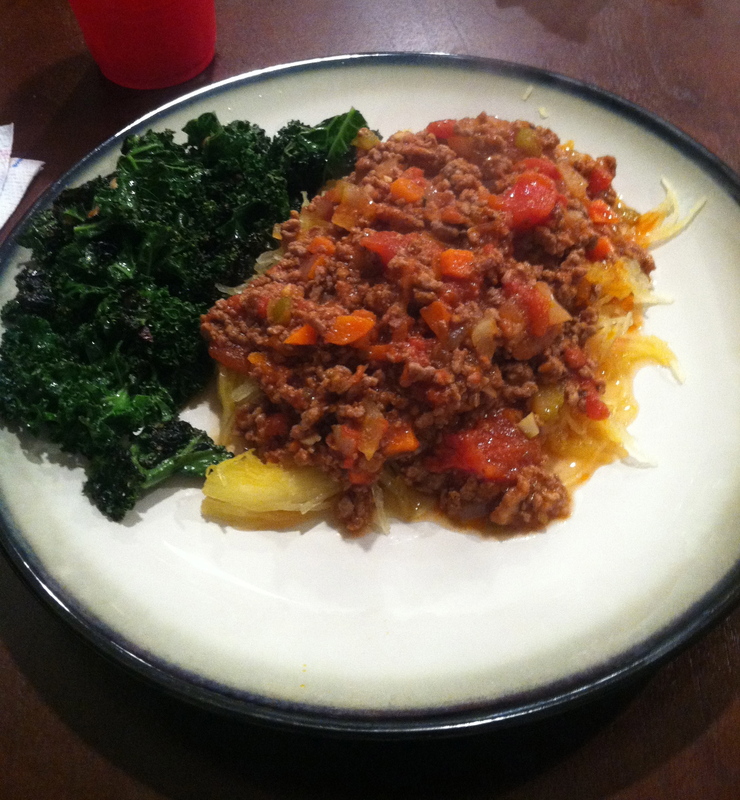 I have never experimented with spaghetti squash before, but my sister-in-law makes ‘spaghetti’ with it ALL the time. I figured it was time to step out of my comfort zone. And come to find out, that was the easy part. The sauce was what was intimidating! All you need is literally…. the squash. One large squash was exactly enough for my husband and me. If you’re cooking for 3 or 4 people I’d buy two, and so on. Step two: Cut the squash in half lengthwise. Step three: Remove the seeds from the middle, much like you would do to a pumpkin. Step four: Place the halves cut side down on a baking sheet. Cook for 28-35 minutes. Make sure to check the squash at the 28 minute mark. If it overcooks it’ll become mushy and you won’t get the ‘spaghetti’ effect you’re going for. Scrape it with a fork and it should shred. If it scrapes easily you know it’s ready. Step five: When the squash is completely cooked, scrape the halves with a fork. They will end up looking like little piles of angel hair pasta, pretty much. Pour your favorite (paleo or healthy!) sauce over the squash strands and you’re all set! 1-2 cloves garlic – minced. Step one: rinse and trim kale. Make sure to cut off JUST the leaves! If you get a piece of the stem when you’re taking a big bite it will taste really, really bitter and gross. Chop leaves into bite size pieces – they sauté faster. Step two: Melt the 1-2 tablespoons of coconut oil in a large non-stick frying or sauté pan and add garlic. Cook garlic for about 30 seconds then add half the fresh kale. Cook, stirring constantly, for about a minute, then add the rest of kale. Step three: Let everything cook down for about 10 minutes. Make sure to keep stirring so garlic doesn’t burn. Step four: When kale has finished cooking, spoon onto a plate and cover with a little lemon juice. You can add salt and pepper to taste for any of these dishes, but I’m trying to stay away from using TOO much salt. If you’re going to add some, make sure to use SEA SALT. 🙂 ALSO my husband LOVED the lemon juice on the kale but it’s easy to overdo it. If you’re only cooking one bunch of kale, squeeze just half the lemon. And there you go friends! That is one of my healthy dinner recipes. Give it a try tonight, I promise it’s super yummy and you won’t even realize you’re not gorging yourself on carbs! this sounds delicious! i’m trying to lower my carb intake but i’m pasta is my weakness. this sounds like a happy medium! oh my goodness carbs are my weakness in general! and sweets. this diet is hard in regards to that but I actually liked the spaghetti squash. I really don’t miss pasta all that much and I used to eat it A LOT!